Based on number of monthly active users, WhatsApp is the most popular mobile messaging app in the world. Facebook Messenger ranked second, followed by Chinese services QQ Mobile and WeChat. Other popular messaging apps include Skype, Viber, LINE, BBM, Telegram and Kakaotalk. Facebook owns the top 2 mobile messaging apps – WhatsApp and Facebook Messenger. The social media giant acquired WhatsApp in early 2014, when the mobile messaging app had only about 465 monthly active users. As of January 2017, there were 1.2 billion monthly active WhatsApp users in the world. WhatsApp is particularly popular in emerging markets such as Brazil, Mexico and Turkey. Initially released in 2011, Facebook Messenger, an app purely dedicated to chatting, was developed to take over the instant messaging function previously connected to the main Facebook app. As of June 2016, there were one billion monthly active users on the app. The number of monthly active users in the app has been consistently growing over the years. In 2014, for instance, the service had 200 million monthly active users only. Facebook Messenger’s popularity can be traced back to the ubiquity of its parent company Facebook. As of the fourth quarter of 2016, the social network had close to 1.9 billion monthly active users worldwide. Messenger has since grown to include features such as stickers or video messages - features made popular by competing photo sharing app Snapchat. Despite WhatsApp and Facebook Messenger’s global leadership, regional markets differ greatly, with the notable mention of the Asian mobile messenger app market. Local messaging apps such as WeChat, LINE, Hike and KakaoTalk are continuously expanding and competing for leadership. As of late 2016, Chinese WeChat was the leading mobile messaging app in Asia, with 846 million monthly active users. Japanese LINE ranked second, followed by Hike and KakaoTalk. 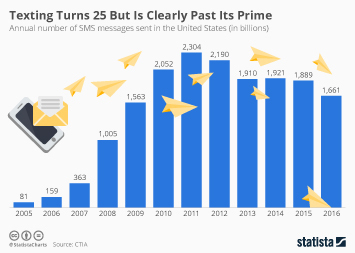 Mobile messaging apps are blurring the lines between messaging and mobile social networks. Photo-sharing apps Instagram and Snapchat are no pure messaging platforms; yet, due to their private messaging functions and the increasing appeal of social content sharing, the platforms have seen unprecedented growth in the last few years. The number of daily active Snapchat users increased from 50 million in March 2014 to 150 million in June 2016; Instagram had 600 million active users as of December 2016, up from 200 million in March 2014.